24-port 1 GbE switch PoE+, three modular slots for optional uplink/stacking ports. Power supply and fan need to be ordered separately. The Brocade ICX 7450 Switch delivers the performance, flexibility, and scalability required for enterprise Gigabit Ethernet (GbE) access deployment. It offers market-leading stacking density with up to 12 switches (576 1 GbE and 48 10 GbE ports) per stack and combines chassis-level performance and reliability with the flexibility, cost-effectiveness, and “pay as you grow” scalability of a stackable solution. 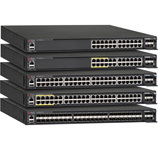 In addition, this stackable switch is the first in its class to offer 40 GbE uplinks, enabling enterprises to dramatically increase their network capacity while using their existing optical wire infrastructure. The unique design of the Brocade ICX 7450 provides three modular slots, offering up to 12 1/10 GbE SFP/SFP+ ports, 12 10GBASE-T ports, or up to three 40 GbE QSFP+ ports for uplink or stacking. As a result, the Brocade ICX 7450 can easily deliver sufficient bandwidth between the edge and aggregation layers to support expanding video traffic, VDI adoption, and high-speed wireless 802.11ac deployment. The Brocade ICX 7450 is an ideal network solution for campus network 1 GbE access or small aggregation deployment with 10 GbE or 40 GbE uplinks to the core. The Brocade ICX 7450 also makes a very suitable data center Top-of-Rack (ToR) solution, delivering a mix of 1 GbE and 10 GbE server connectivity ports with 10 GbE or 40 GbE uplinks to the data center aggregation or core. * OpenFlow support to be available in future release. The Brocade ICX 7450 is easy to deploy, manage, and integrate into both new and existing networks. Organizations can buy only what they need today, and easily scale out as demand grows and new technologies emerge. With three modular slots, the Brocade ICX 7450 enables organizations to grow their networks when necessary. Organizations can initially deploy 1 GbE or 10 GbE uplink ports and upgrade to 40 GbE ports on-demand with a new, high-speed module. The Brocade ICX 7450 also offers a low-cost entry point. By providing the flexibility of a stackable switch, the Brocade ICX 7450 saves organizations from having to invest in a costly chassis upfront and tie up valuable capital. Instead, they can buy a single Brocade ICX 7450 Switch to get started and add new Brocade ICX 7450 Switches to the stack as their business grows. Brocade Ethernet switch stacking technology makes it possible to stack up to 12 Brocade ICX 7450 Switches together into a single logical switch using two standard QSFP+ stacking ports. This allows the Brocade ICX 7450 to deliver a class-leading 160 Gbps of backplane bandwidth and offer simple and robust expandability for future growth at the network edge. A selection of standard QSFP+ copper cables or standard QSFP+ optics can be used to stack Brocade ICX 7450 Switches together, enabling stacking over distance and thereby eliminating the need for stacked switches to be colocated in the same wiring closet. This stacked logical switch also has only a single IP address to simplify management and offers transparent STP-free traffic forwarding and shared Link Aggregation Groups (LAG) across a pool of up to 576 1 GbE ports and 48 10 GbE ports. When new switches join the stack, they automatically inherit the stack’s existing configuration file, enabling true plug-and-play network expansion. Brocade stacking technology also delivers high availability, enabling instantaneous hitless failover to a standby stack controller if the master stack controller fails. In addition, organizations can use hot-insertion and removal of stack members to avoid interrupting network services. The Brocade ICX 7450 provides simplified, standards-based management capabilities that help organizations reduce administrative time and effort while securing their networks. sFlow is a modern, standards-based network export protocol (RFC 3176) that addresses many of the challenges that network managers face today. By embedding sFlow hardware support into the Brocade ICX 7450, Brocade delivers an “always-on” technology that operates with wire-speed performance. sFlow dramatically reduces implementation costs compared to traditional network monitoring solutions that rely on mirrored ports, probes, and line-tap technologies. Moreover, sFlow gives organizations full, enterprise-wide monitoring capability for every port in the network. The Brocade ICX 7450 supports auto-configuration, simplifying deployment with a truly plug-and-play experience. Organizations can use this feature to automate IP address and feature configuration of the switches without requiring a highly trained network engineer onsite. When the switches power up, they automatically receive an IP address and configuration from DHCP and Trivial File Transport Protocol (TFTP) servers. At this time, the switches can also automatically receive a software update to be at the same code revision as currently installed switches. The Brocade ICX 7450 includes an industry-standard Command Line Interface (CLI) and supports Secure Shell (SSHv2), Secure Copy (SCP), and SNMPv3 to restrict and encrypt management communications to the system. In addition, support for Terminal Access Controller Access Control System (TACACS/TACACS+) and RADIUS authentication helps ensure secure operator access. Software-Defined Networking (SDN) is a powerful new network paradigm designed for the world’s most demanding networking environments and promises breakthrough levels of customization, scale, and efficiency. The Brocade ICX 7450 enables SDN by supporting the OpenFlow 1.3 protocol*, which allows communication between an OpenFlow controller and an OpenFlow-enabled switch. Using this approach, organizations can control their networks programmatically, transforming the network into a platform for innovation through new network applications and services. The Brocade ICX 7450 delivers OpenFlow in true hybrid port mode, which allows organizations to simultaneously deploy traditional Layer 2/3 forwarding with OpenFlow on the same port. This unique capability provides a pragmatic path to SDN by enabling network administrators to progressively integrate OpenFlow into existing networks, giving them the programmatic control offered by SDN for specific flows while the remaining traffic is forwarded as before. Brocade ICX 7450 hardware support for OpenFlow enables organizations to apply these capabilities at line rate. Managing enterprise campus networks continues to become more complex due to the growth in services that rely on wired and wireless networks. Services such as Internet, e-mail, video conferencing, real-time collaboration, and distance learning all have specific configuration and management requirements. At the same time, organizations face increasing demand to provide uninterrupted services for high-quality voice and Unified Communications (UC), wireless mobility, and multimedia applications. To reduce complexity and the time spent managing these environments, the easy-to-use Brocade Network Advisor discovers, manages, and deploys configurations to groups of IP devices. By using Brocade Network Advisor, organizations can configure Virtual LANs (VLANs) within the network, manage wireless access points, and execute commands on specific IP devices or groups of IP devices. sFlow-based proactive monitoring is ideal for performing network-wide troubleshooting, generating traffic reports, and gaining visibility into network activity from the edge to the core . Brocade Network Advisor centralizes management of the entire family of Brocade wired products and Aruba wireless products. When every second matters, Brocade ICX 7450 switches help deliver continuous availability to optimize the user experience. Brocade stacking technology delivers high availability, performing real-time state synchronization across the stack and enabling instantaneous hitless failover to a standby controller in the unlikely event of a failure of the master stack controller. Organizations also can use hot-insertion/removal of stack members to avoid interrupting service when adding a switch to increase the capacity of a stack or replacing a switch that needs servicing. In addition to stack-level high availability, Brocade ICX 7450 Switches include system-level high-availability features, such as dual hot-swappable, load-sharing, and redundant power supplies. The modular design also has dual hot-swappable fan trays. These features provide another level of availability for the campus wiring closet in a compact form factor. Additional design features include intake and exhaust temperature sensors and fan spin detection to quickly identify abnormal or failed operating conditions—helping to minimize mean time to repair. The Brocade ICX 7450 can deliver both power and data across network connections, providing a single-cable solution for the latest edge devices. In addition to supporting the Power over Ethernet (PoE/PoE+) standards, the Brocade ICX 7450 also supports Power over HDBaseT (PoH). This new, high power standard delivers up to 95 watts per port through a standard Ethernet cable, simplifying the wiring of next generation Ethernet connected devices such as large HD displays, video surveillance equipment and VDI thin terminals, enabling data and power to be carried by a single Ethernet wire. The PoE/PoE+ and PoH capabilities reduce the number of power receptacles and power adapters while increasing reliability and wiring flexibility. With a 1,500-watt power budget per switch (with two power supplies), the Brocade ICX 7450 24- and 48-port PoE models can supply up to Class 4 PoE+ (30 watt) power to every port and PoH power (95 watt) on eight dedicated ports. 1Switch includes 1 AC power supply, 1 fan, one 4×10 GbE SFP+ uplink module, two QSFP+ stacking modules. 2Traffic load on all ports connected with maximum possible PoE/PoE+/PoH loads (if equipped). 3PoE power not included in switch heat dissipation figures since the heat is not dissipated at the switch.